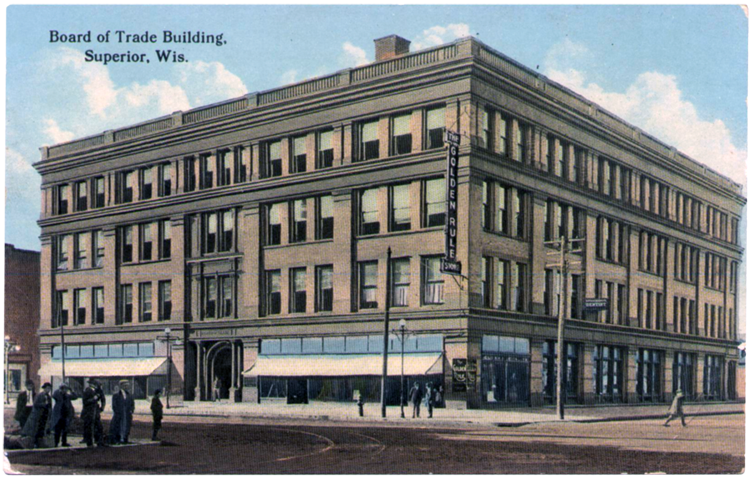 When it first opened its doors in 1892, Superior’s Board of Trade building was known as the Minnesota Block—and was yet another Superior building financed by Robert Belknap’s and John Hammond’s Land and River Improvement Company. Its name changed in 1894 when Superior’s Board of Trade moved in. By 1908 the Fair Store, a large dry-goods store operated by brothers P. C. and A. J. Pederson, occupied the lower two floors. The Pedersons sold men’s and women’s clothing as well as household goods, acting as an early department store. In 1911 local architect John O. Bach drew up plans to remodel the building; they called for an arcade front that would double the display area in the first-floor show windows, but no records state whether the plans were ever put into place.